Poll: Are you happy the pope is visiting Ireland? The country’s relationship with the Catholic Church has changed dramatically over the years. Pope John Paul II in the Phoenix Park in September 1979. POPE FRANCIS IS set to begin a two-day visit to Ireland today. The pontiff will visit a number of places in Dublin today, before travelling to Knock Shrine tomorrow and later celebrating Mass in the Phoenix Park. Hundreds of thousands of people are expected to attend the various events. 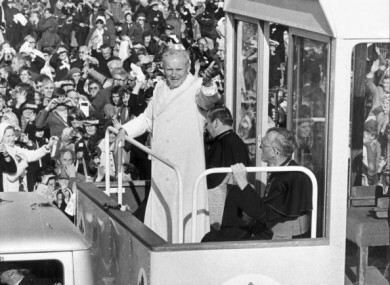 Some 2.5 million people attended events when Pope John Paul II visited Ireland in 1979. The country has become more secular in the decades since then, and a litany of abuse revelations have emerged. However, 78.3% of people identified as Catholic in the 2016 Census, meaning it remains by far the largest religion in Ireland. The pope is expected to meet survivors of clerical abuse at some stage during his visit but details of the meeting won’t be announced until after it has taken place. Let us know: Are you happy the Pope is visiting Ireland? Email “Poll: Are you happy the pope is visiting Ireland?”. Feedback on “Poll: Are you happy the pope is visiting Ireland?”.